Earthbound, released in 1995 for SNES, went against the RPG grain in many ways. It is perhaps for this reason, in addition to the dated graphics (even for '95!) and JRPGs then-niche status in the US, that the game bombed when it reached our shores. Apparently, it bombed so hard that Nintendo of America never gave the series another chance in the States, and we've had to rely on fan-translations of imports to get our fix. This is a shame, because Earthbound is perhaps the best, most unique SNES game ever made. I'd go as far as to say that even non-RPG fans will dig Earthbound. 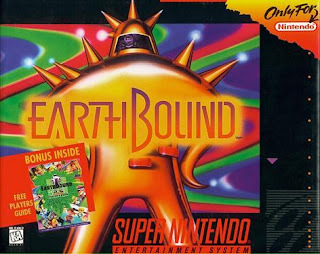 As for the premise of the game itself, Earthbound had some unusual quirks that made it stand out. The first was that the game was a more comical take on the usually super-dramatic RPG genre. Without giving away too much, the story follows a 10-year old boy named Ness, who uses his trusty baseball bat and psychic powers to battle a wide, diverse cast of enemies ranging from crazed hippies, aliens, zombies, cranky old men and even possessed guitars! 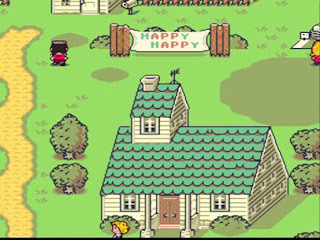 Earthbound is set in a wacky, psychedelia inspired Japanese take on modern day suburban USA. This is in stark contrast to the RPG norm at the time, which usually included a medieval setting with the typical "I BELIEVE IN MYSELF AND MY FRIENDS!!" anime cliche for the main character. The humor in this game is also off the charts, and you'll meet some genuinely weird as hell characters before the story is done. The gameplay is very simple and easy even for RPG newbies to grasp. The battle system is typical turn-based fare, a la Dragon Warrior/Dragon Quest. However, you'll also find some new and innovative features, such as slot-machine style hitpoint counters (making it easier to flee battles without dying), that many of today's RPGs still ignore. What those features are? You'll have to play for yourself. The music is also a very strong point, and I'm not just saying that because of nostalgic value. No, the tunes you'll find in Earthbound are very diverse and memorable, including influences from pop, jazz, blues, electronica, and especially psychedelia. While many will cite the graphics as being of poor quality, even back when it was released, they are colorful and bursting with charm, a quality that is sorely lacking in many of today's games *sniff*. This game gets a Slaytanic!